Alva was one of the four designated land office towns at the opening of the Cherokee Outlet in 1893. Its name honors Alva B. Adams, pioneer attorney for the Santa Fe Railroad whose main line (now the Burlington Northern-Santa Fe Railroad) serves Alva. Adams later became governor of Colorado. Today, Alva is the county seat of Woods County and prosperous home to Northwestern Oklahoma State University. Alva is built around an interesting "courthouse rectangle." The Cherokee Strip Museum houses one of Oklahoma's best collections of pioneer exhibits. There's also a museum in Jesse Dunn Hall on the college campus. This museum features natural history exhibits, Indian relics, and one of the best taxidermic bird collections in the United States. The college itself is actually Oklahoma's second-oldest normal school. 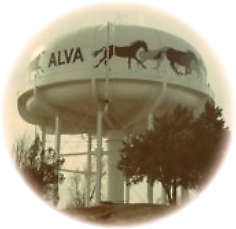 It's first building was built by the citizens of Alva. The "Castle on the Hill" was designed by Jeseph Foucart of Guthrie, but the building later burned in 1935. Of considerable interest is a book in the college library - it contains more than 600 listings for 300 ranches registered with the Cherokee Strip Livestock Association for the roundup of 1886! Situated in the center of a "tourism triangle," Alva is approximately 30 miles from each of three outstanding attractions--the Great Salt Plains, Alabaster Caverns State Park, and Little Sahara State Park. Alva is known for its great hunting and fishing. The Nescatunga Arts Festival, celebrated the first Saturday each June, features artists and craftsmen from a four-state region on the downtown square, entertaining visitors with exciting talent, exceptional art, imaginative crafts, and fantastic foods. Northwestern Oklahoma State University Museum houses one of the top taxidermic bird collections in the United States and also has natural history exhibits, fossils, and Indian artifacts.